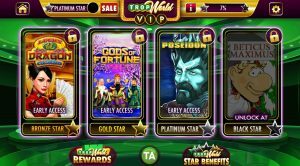 VIP TropWorld Casino – Unlock Exclusive VIP Slots! Play your way through your favorite slots to unlock the prestigious VIP Casino with top ranked games from Everi, Konami, Aristocrat & more that only YOU have access to! TropWorld offers 5 exciting VIP levels, each offering amazing benefits & new VIP slots games unlocked! In addition, boost your progress with free rewards & experience points every time a purchase is made. Use your TropAdvantage points to grab free night stays, free meals & more from your favorite Tropicana Casino property. Leveling-Up!Leveling-up is easy when you are winning BIG jackpots in TropWorld. Each spin or bet made will bring you one step closer to unlocking a new VIPlevel and new VIP slots. Increase your bets to boost the amount of XP earned when playing the best free slots, video poker, keno, blackjack & bingo! Sync your Facebook account for 25,000 FREE coins & play with your friends every day for a friends bonus! TropWorld offers monthly exclusive sales & promotions for MASSIVE discounts on coins & extra TropAdvantage points for MORE free rewards! Dive into the excitement of TropWorld & work your way up to Black Star VIP for the best free casino experience available and exclusive VIP slots! Download the exciting TropWorld Casino app on your favorite Android, iOS, or Kindle device. Don’t like playing on your mobile device? Not a problem! You can play TropWorld Casino on Facebook’s GameRoom or play on our website at www.TropWorldCasino.com. See you in TropWorld Casino!